No other nation at this time could rival Britain’s technological expertise. In the 1800s there was an exceptionally stimulating atmosphere for those interested in science, engineering and invention. The Victorians loved gadgets and would use them in every aspect of their everyday life to save time and energy. 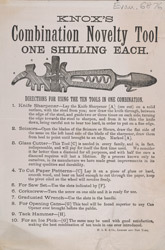 This leaflet is advertising Knox’s combination novelty tool that features a variety of useful attachments such as a knife sharpener, a pair of scissors and a corkscrew.